But also - we are always in need of the supplies and items on our Wish List, below. Thank you for your interest in seeing us grow our rescue, care and educational efforts. We appreciate all good energy, support and participation! Wood Chips Bedding - Flake, in the white bags (not Fine). 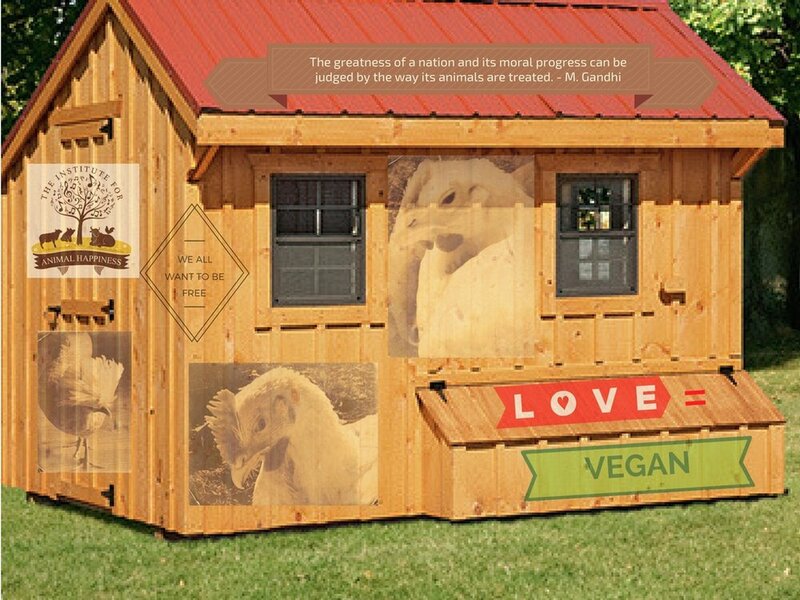 We started off with just a room in our "human" home becoming a de-facto "Chicken Hotel." Then came our first hand-built, beautiful, premium quality insulated coop… then several predator safe run and paddock areas, then TWO MORE beautiful handbuilt coops - and we continue to embrace growth and mindful expansion, in order to provide refuge for more beings in need. We would like to find a good patch of land in our area (minimum 25 acres) that would allow us to accommodate and utilize volunteers better, have room for outbuildings so we can continue improve and expand facilities, and allow us to add more educational programs as well. You can learn more about the first coops we built by clicking HERE - and we now have a written, detailed business plan outlining the organizations current programs and status, and future plans - viewable upon request. Click this button if you would like to assist the Institute with this type of growth! Our VIDEO page and YouTube channel contains just a few of the films we have made on animals and we are uploading more soon that have been shared on FB and seen by countless people.